As managing editor, I handle mostly the business side of things at Lilith, making sure everyone else has what they need to do their job, connecting with printer, the magazine fulfillment house, customer service, making sure folks get paid. I like to think one of my specialties is turning a subscriber who has a complaint into a fan of the magazine. If someone has a difficulty and they don’t let us know, we can’t do anything about it. (So please speak up, reach out!) In addition to that, I am the resident Hebrew language aficionado at Lilith, and I have translated several pieces from Hebrew for the magazine; this feminist magazine has always been a workplace where everyone’s thoughts, opinions and experiences about everything are welcome and valued. I also compile the Happening pages, Lilith’s resource section at the back of each quarterly issue, and sometimes review books for young readers. Oh, and I enjoy cooking and sharing food at our communal vegetarian lunches at the Lilith office. YZM: When did you start writing picture books, and how many have you written? ND: I’ve wanted to write since as long as I can remember. Even though I was generally a very good little girl, when I was about seven years old, while shopping with my mother at a department store, I stole a slender little gold-painted pencil from a fancy leather-bound message pad. Later, when I showed it to her, my mother drove me all the way back to the store so I could return the pencil. She didn’t turn me into the police, which I always understood as a demonstration of her love for me and her caring about my moral education. As a child I had several aunts who gave me wonderful books as birthday presents. I particularly remember The Cat in the Hat, All-of-a-Kind Family and Alice in Wonderland. I liked to share stories with others and went through a phase where I folded paper into little envelopes that I pasted into the back of books we owned, and cut index cards to fit in them to have a lending library for the kids on my block, or maybe it was to share with my sisters, I’m not sure. I remember moping around the house with a notebook asking my parents to please tell me what I should write about. But then when I was eleven, I wrote a memoir about my 18-day stay in an upstate hospital due to a ruptured appendix at sleep-away camp. I submitted it to a correspondence school for writers and got my first personal rejection slip telling me I had talent, and to keep on writing. That submission was part of a sort of hobby of clipping and responding to ads from magazines that offered items “free with no obligation,” which I stopped, chagrined, after an encyclopedia salesman showed up at our house to tell my parents that they really ought to purchase a very expensive encyclopedia I had indicated an interest in. As a teenager growing up in New York I learned you could go, as a mere admirer, to funerals of famous people. I sat next to news broadcaster Walter Cronkite at John Steinbeck’s funeral where actor Henry Fonda read from The Grapes of Wrath. Aside from a capacity for romantic crushes, and my own ambition to be a published author, as a reader and a writer, I’ve never been into fantasy. YZM: When did you get serious about picture books? I began to write picture books seriously nearly forty years ago, as a new parent trading babysitting time with a couple of writers whom we met in Lamaze class and who quickly became our dear friends. While Grandpa Naps is my fifth picture book to be published. While over the years I’ve of course been busy with other things, I consider two of my strengths as a writer are being extremely patient and stubbornly persistent. I’ve acquired a pretty good knowledge of the children’s book industry by now and am a repository of rejection experiences along with just enough successes to keep me going. YZM: I Hate Everyone has been making a splash, with the New York Times’ Marisha Pessl writing that “The book reads like a version of Whitman’s barbaric yawp. It’s wildly alive,” and adding a (positive) comparison to Tolstoy for good measure. Meanwhile, School Library blogger Betsy Bird’s wrote that: “… any parent curious to see how an author and illustrator can verbalize what, in many children, can only be expressed through frustrated fire and fury, will find in ‘I Hate Everyone’ a balm and a friend…” With such glowing reviews, readers might be surprised to learn that the book took a long time to find a home; can you talk about why? ND: Yes! 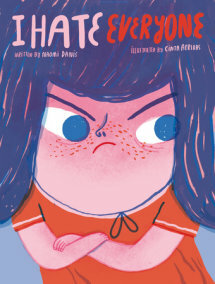 I’m quite certain I would not have written I Hate Everyone, or believed in it enough to keep trying to find a publisher, had I not spent many years in therapy and psychoanalysis. I sent the manuscript out gradually to about 40 publishers over a period of ten years before it found a wonderful home with editor Jordan Nielsen at Pow Kids! Books. Several editors had taken the trouble to write back to me that it resonated for them, they felt it was psychologically true, and they thought it was funny and really liked it, but they were concerned that grown-ups would not want to buy or read a book where they had to say aloud the words “I hate you” repeatedly to a child they loved. So it took a brave editor to take the book on, and one who could visualize how it might be illustrated successfully. The illustrations by Cinta Arribas add so much to the book. YZM: What’s your next book about? ND: While Grandpa Naps is inspired by a story my late husband had told me, about when he was a little boy and his grandfather asked him to sit next to him and watch that no flies would bother him while he took a nap in the hammock in their backyard. The grandmother had recently died, and a new baby was on the way. It is a story of family love, and also a story of mindfulness from a child’s point of view. I think of both I Hate Everyone and While Grandpa Naps as being about the sometimes surprising experience of love. YZM: How has it been combining the writing life with the magazine life? By experiencing the publishing world from both sides, I’ve come to see that for a writer it’s important to be persistent without being annoying. It’s helped me understand that when my writing is rejected—or ignored for that matter— it may be disappointing, but it’s rarely personal. Also, my Lilith colleagues have been enormously supportive and encouraging of my writing for kids. YZM: Have your own grandchildren been enjoying your books? With While Grandpa Naps, there was a surprising irony for me. Like young Gilbert in the story, my grandson Gideon, who was named after Gil, was five, about to start kindergarten in the fall, and had a new baby sister who was named after a great grandmother who had recently died (my mother). So I have the feeling that Gideon saw himself in this story, in a way that might even have seemed a little mysterious to him. YZM: What’s one thing you wish I’d asked but didn’t? Oh, I’m afraid I’ve said too much already! One question I always ask about the books for young readers that come our way at Lilith: Is there something Jewish/feminist about this book? While Grandpa Naps mentions the Ashkenazi custom of naming a baby for a deceased relative. (Which, incidentally made it ineligible for consideration as a PJ Library book because their books are—in my opinion little too rigidly—not allowed to mention death, no matter how gently.) And as for feminism, the narrator, young Gilbert, is a little boy who is a natural carer. To me, without it being explicit, the grandpa in this story is Jewish; at the same time, his friendly laughing at the end of the story reminds me, in hindsight, of the Dalai Lama. Maybe laughter is just a universally wise coping mechanism of aging. 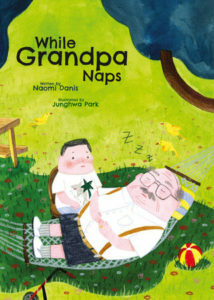 While Grandpa Naps will launch at Books of Wonder on Monday, April 15 from 6-8 pm.